While everyone is talking about Bento, I should start sharing on a baby’s meal. I’m a new mother and still learning and experimenting on what is best for a baby’s diet. Jonathan boy is my experiment. Glad to say that he will wallop all kinds of food except Avocado so far. I’ve also shared in my previous post on how I prepare the porridge. Just dump everything in the ceramic pot. So let’s see what is on Jonathan’s dinning table today. Beets or beetroots contain a wonderful amount of calcium, potassium and even vitamin A. Whereas, broccoli is very high in Vitamin C and is a great source of soluble fiber. This entry was posted on Monday, September 15th, 2008 at 5:10 pm and is filed under Family News, Jonathan's Meal. You can follow any responses to this entry through the RSS 2.0 feed. You can leave a response, or trackback from your own site. The colour looks so nice and yummy 🙂 Did you put in any meat at all? What do you used for seasoning? Julie, the porridge look so yummy. I also like Sarah to try beetroot but i cant get it over here. yummy. does it turn out sweet? i didnt try beetroot before. i never try this for my Eli, hehe..will try one day. Caroline – You can add meat/fish as you like. I don’t add any seasoning to Jonathan’s porridge. Try to train him to eat it plain. 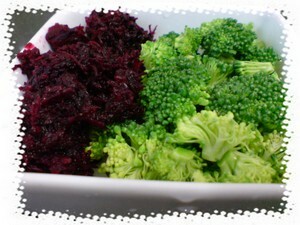 June – Beetroot can be cooked with any combination too. Give it a try. Joanne – I normally buy beets from supermarket. Hardly can see it it wetmarket. Ryan’s mami – Try on Ryan. Wonder if he likes it since he’s kinda choosy on food, right? Littlelamb – It’s not as sweet as sweet potato but it does add some taste to the porridge. When you eat it raw, it’s just like chinese turnip. HuiSia – Hope Eli likes it too despite the colour. Yalor…I even dont know what is beetroot until you and Caroline posted about it. I’ve never tried beetroot before. 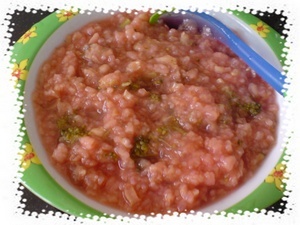 It gives the porridge such a nice color but how’s the taste? hmm… looks yummy. but, my all-time favourite is grated carrot with rice and chicken meat for taste. slurp! hi, I popped by from Chanel’s blog. My kids love beetroot soup. They’re indeed yummy and full of nutrition. hey, Jonathan mommy…u r such a great mommy who knows well about the vitamin.